Coaxial couplers are a very basic microwave device used in most microwave systems, test sets and applications for monitoring RF power. 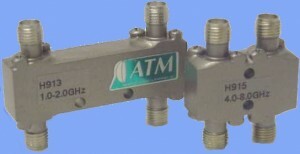 ATM’s supplies directional coupler covering Frequency bands from 0.25-40.0 GHz (250-40,000 MHz). ; ATM supplies both wideband multi-octave and Octave band units. 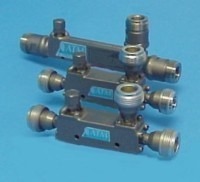 We have designs in Airline for Very High power (our CH and CHP models) and Stripline for low cost and small size. Many of our design are available in a variety of connector types, SMA, Type N, SC, 7/16 and 2.9mm (K Type). Most common models are shipped from stock. Directional couplers are used in a wide variety of applications to sample incident and reflected microwave power without disturbing the transmission line. Applications for directional couplers include line monitoring, measuring power and load source isolators. Coax directional couplers can be used for sample power from a line without altering the characteristics of the line. Power measurements are achieved by inserting a directional couple and using simple, low level detectors or field strength meters and power measuring equipment. Reversing the coaxial coupler in the transmission line can provide an indication of impedance match and/or reflected power can be computed by comparing the forward power levels to the reflected power levels. Dual directional coupler may make this task easier. A signal can be acquired from the source to the tap with high attenuation between the tap and the load. © 2001-2016 All Rights Reserved.